·· Pablo Picasso is where it's at. 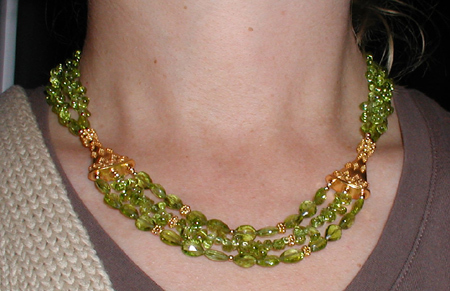 This was made to match the Turquoise and Bali vermeil choker. Here again, some experimentation with photographing jewelry. This is a plain white cotton tee shirt and a different camera. I think the white paper used for the choker background worked better...but I think this camera works better (it's about the same age as the other camera, but I'm more familiar with the settings on it). I got this tip from the jewelrymaking.about.com forum...because I was at the point where I was trying to make a four-strand, twisted bracelet and I kept getting the length wrong. With the strands loosely twisted, the length was fine, but after wearing it for a bit, I realized it would look so much better were the strands twisted once more...and then, you guessed it, the whole piece became doll-sized. There is no real way of measuring the strands, because the length is next to irrelevant unless you're talking about a single strand of beads. 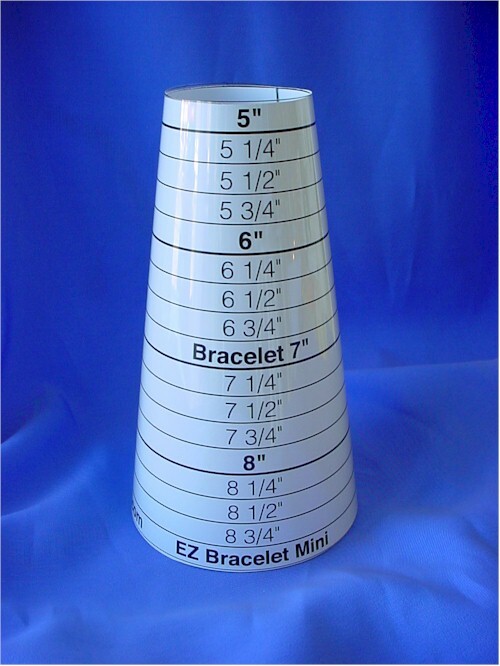 I contemplated making my own form and even started measuring plastic drinking glasses...but decided to go ahead and buy a readymade one, because it struck me as being practical. If it's as durable as it says it is, and accurate, it'll pay for itself because you need to use it every time you make a bracelet. This one has 1/4" increments, meaning you would know exactly how much longer or shorter you need to make the piece. Again you could make your own...looks like you could make it out of stiff paper actually. Hm. Interesting. I decided on the "travel size" simply because artbeads.com carries it, and it would appear to serve the vast majority of my measuring needs. I don't make ankle bracelets too often and if I did, I could measure the strand (don't foresee making multi-strand anklets!). Likewise I could just measure really small pieces. I'll post a review when I get the EZ Bracelet Sizer. I did Google it first of course--it is carried by several merchants as well as the inventor. And people have commented on it on beading forums. I got an overall impression of satisfaction with it, some people did say you had to play with it for a while to figure out exactly where you want your pieces to lie. I'm going on what they call "cold turkey" on the cosmetics forums...all it means is that you stop buying something for a set period of time (with a couple of ground rules of course). Makeup junkies love to buy makeup, natch, so cold turkey for them means not buying cosmetics for x months. I have a lot of supplies now, so I'd like to not buy them for...hm. It's the end of March now, so I'd like to go at least a quarter without buying beads and components. As to the ground rules, that would cover necessities such as crimps, crimp covers, stringing material, wire as needed (I don't think I actually need wire, I'm just saying)...stuff like that. Bails and clasps and stuff like that, fall into a somewhat grey area, but I'd like to see what I can do with what I already have on hand. Having done quite a few cosmetics cold turkeys, I can say it's easier than it looks. It's easy to fall into a habit of buying. Once you stop buying new things, you then have time and space to examine what you already have, and come up with a better concept of what you actually need. lol! I strung this same piece three times, on a double length of softflex. The first time I got the length wrong...decided it looked best as a choker on its shortest setting. Bugger. The second time, I got the crimps right but neglected to leave enough space for the crimp covers...I'm not kidding, it was off by literally one millimeter (space enough for a 2mm crimp but not a 3mm crimp cover). It's that kind of mistake that's worth fixing, as tedious as it is, because I know it's going to bug me unto eternity if I don't fix it. I think the engineering is good though, because so many crimps would have to fail, it's not all on one crimp, or even two. I made the little extender chain and I'd like to see how that flies. It's regular handmade jump rings connecting soldered jump rings. Here the advice was to use a white background, natural indirect lighting, set the white balance setting to sunny...there is more advice also, including to use a tripod, however this is as far as I got (I don't have a tripod as of yet). It's much better focused than before. They had this in San Francisco and I managed to get out for one of the three-day-weekend shows. I would have liked to have gone again...this one was roughly twice the size of the one I went to last year...lots and lots of stuff. I ended up buying from two merchants (last year I bought from only one...the same one I bought from this year). I got some American turquoise rounds and barrel shaped beads. Also small labradorite rounds...pretty good "flash" for the cut and size, although it looked as much golden as blue...labradorite rondelles, aquamarine rondelles...and from the other merchant, freshwater pearls. This show had a lot of items the other show didn't...kyanite, amber, greenish American turquoise, Hill Tribe silver, some Bali style items... I suppose it might be good I didn't go a second time. You have to pace yourself with this stuff. At first I thought, at least I'm not reinventing the wheel...since this is the same design as the black crystal necklace. But, I wanted the two side strands to be twisted, and that doesn't work. 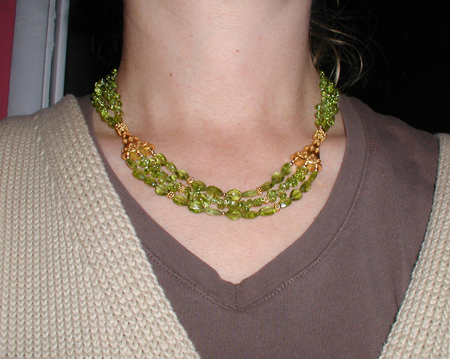 If you do that, the tension in the twist migrates to the 3-to-1 beads and twists them too, messing up the front of the necklace.